It is something that continually frustrates me about iOS, having to manually go into the App Store when that bubble tells me I have updates, look at what it’s updating, and then hit update all. It’s gotten better since Apple disabled the need to enter a password to update Apps, but it is still a tedious process. 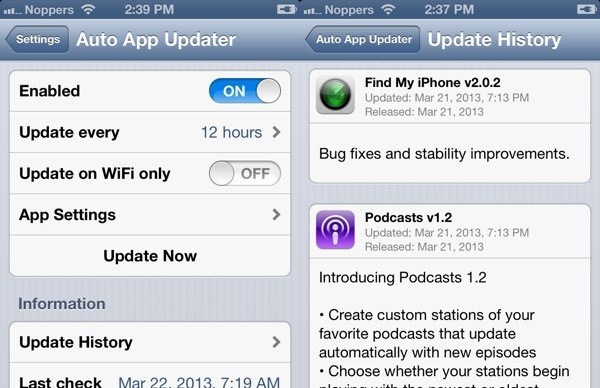 Luckily if you have a Jailbroken device, a Cydia Tweak called Auto App Updater will allow you to do exactly what the name says – Auto-Update iOS Apps without any intervention. The $2.99 tweak from the Modmyi repo in Cydia automatically downloads and installs updates for all available iOS Apps, notifying you when the process is complete. It is configurable through the Settings.app and requires iOS 6.1 or higher, so you won’t see any additional icons on your springboard. In addition, it features the Auto-Update iOS App history which will list the new features available from that update and a list of recently updated Apps. A schedule can be configured to make sure it doesn’t update an App you may be using, and perhaps have it complete the updates during the night for minimal disruption. To prevent the updates from eating up all your cellular data, there is a setting to restrict the downloads to WiFi only, as well as a toggle to automatically retry failed downloads should anything fail first time round. Auto App Updater is available right now in Cydia for only $2.99, so go ahead and search for it to download now. To Auto-Update iOS Apps is something I have been wanting for ages, ensuring I always have the latest version of the App without having to continually check for updates or manually trigger the download. Let us know in the comments section below if this is something you’ve been waiting for, and your experiences.